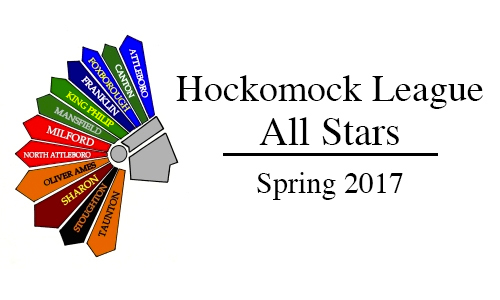 Below are the official Hockomock League Boys Tennis All Stars. Canton, 2 @ Franklin, 3 – Final – Franklin junior Rahul Herur won at first singles and the Panthers swept doubles play to beat the Bulldogs. Herur picked up a 6-3, 6-1 win while junior James Johnston and senior Tom Mancini won 6-2, 6-4 at first doubles. The team of sophomores Tyler DiPalma and Derek Wu clinched the win with a 6-2, 6-0 victory at second doubles. Canton sophomore Jake Wolicki won 6-1, 3-6, 6-2 at third singles and senior Nathan Maltz won 4-6, 7-6, 1-0 (10-8) for the Bulldogs. North Attleboro, 1 @ Sharon, 4 – Final – Sharon picked up a pair of wins at both singles and doubles to hand the Rocketeers their first loss of the season. Sophomore Lulu Yuan won 6-3, 6-3 at first singles and freshman Nupur Shulka won 6-2, 6-0 at second dingles. The team of Pooja Puttigampala and Michal Kondratiev won 6-4, 6-2 at first doubles and Katie Merport and Rithika Neti won 6-3, 6-3 at second doubles. North Attleboro’s Allie Grinavic won 6-2, 2-6, 1-0 (10-8) at third singles.